Home » Articles » 104. Do You Allow Yourself to Make Mistakes? 104. Do You Allow Yourself to Make Mistakes? Blundering, stumbling or making mistakes. We don’t like to do this but it happens to us daily. And if you’re successful at something, maybe you wave it away. “Oh well, it worked out, but thanks to the others.” Or, “It’s not a complete success but ok”. People who make these kinds of statements are probably perfectionists. These people can make life pretty difficult for themselves but also for the people around them when they expect the same high standards from the people around them. If you have a tendency to be a perfectionist, there’s a large chance that you get in your own way. If you want everything to be perfect and don’t take the chance of making mistakes, this can be the main reason you don’t get started on anything. The fear of failure is greater than the chances of success. 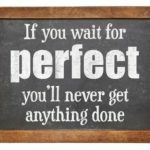 How do you become a perfectionist? 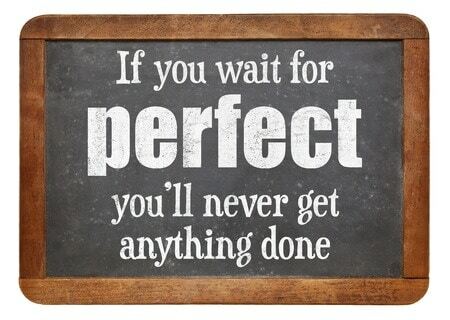 If you are a perfectionist, you expect too much. You expect a lot from yourself and set high standards. If what you do is anything less, you haven’t reached your own standards and disappoint yourself. The result can be that you are hard on yourself and give up. “See, I can never get it right.” It destroys your ability to take initiative and can cause you to become apathetic or depressed. I always work with two standards. One is the highest possible. If I reach that, it’s perfect. And the second is the “amply sufficient” standard. If my work is “amply sufficient” enough to make it public, then it is acceptable. It’s good enough. By doing this, I put perfectionism into perspective. The funny thing is that when a perfectionist thinks that something is “amply sufficient”, it is usually very good and the few less-than-perfect details are insignificant. Almost everyone who is highly sensitive is also a perfectionist. They usually have high expectations of themselves. To prevent themselves from failing, they want to do everything perfectly. If they don’t succeed, highly sensitive people feel shame. It makes it more difficult for them to start something the next time. Many highly sensitive children and teenagers escape into computer games. It’s a difficult challenge to accept that something may not be perfect but that it’s still good. Becoming conscious of this is the first step. Highly sensitive people also take everything personally. If their work is not approved of, it’s as if their entire person is being rejected. For highly sensitive people it’s of great importance that they learn to discern between whom they are and what they do. Step 3: Detach father. Detach mother helps with letting go of the disapproval you used to experience. From your father or other men/boys. From your mother or other women/girls. By letting go of the disapproval, you relax and realize that it’s ok when things don’t go perfectly. In step 4: Clear meridians we find the large intestine meridian. When this meridian lets go of the blockages to it, the exaggerated and rigid feelings of having to do everything perfectly also disappear. In step 7: Fulfill basic needs are such needs as “Appreciation”, “Love” and “Approval”. When these needs within yourself are fulfilled, you begin to appreciate yourself and your work more. You reassure yourself, “It’s all right if it’s not perfect. It’s good enough.” You increase your love for yourself: “I worked hard for this and with this time given and these circumstances what I did is really good.” You give yourself approval. “Well done, girl.” And then you almost automatically bring your right hand to your left shoulder and pat yourself on the back while saying, “Well done!” The feeling of pride within yourself will grow! Even though I only mention a few of the steps above, it’s important to do always do all 9 steps. The steps cooperate together to form a whole. And how is the MIR-Method working for you? Are you growing fonder of your own work? Do you allow yourself more to make mistakes? Do you feel more proud of yourself? I’d love to hear about it from you! Please write about it below. Thank you! Sincere greetings and my wish for you is that you and the perfectionist in you get along well with each other! Dankjewel voor je compliment! Welk schilderij bedoel je precies? Ik denk dat je verwijst naar de schilderijen op mijn persoonlijke website? Wie weet krijgen we ook van andere Ménière patiënten te horen dat de MIR-Methode ook bij hen heeft geholpen. Ik hoor graag van je als dat het geval is. Mocht ik erover horen, laat ik het jou weten. Wat fantastisch dat je er een boek over hebt geschreven! Ik hoop dat het veel mensen met Ménière kan steunen, want het lijkt me verschrikkelijk om te hebben, omdat het je hele leven in de wachtkamer zet. Ben zo blij met het bericht uit Canada! Ja, ik zal het je doorgeven als we van meer mensen horen. En veel succes met je boek! Hi Mireille!! I am barely a week into practicing the MIR Method and I have to say that I am absolutely in love with it!! I’ve already stopped getting headaches from shampoo sensitivities and my scalp no longer hurts me. After only 2 days of practice!!! I have been quite the perfectionist in character, created by my parent’s constant judgements as a child I believe, and it’s so relieving to just relax and let myself be who I am without feeling the need to be perfect or that I am being judged. I am feeling the beginnings of a releasing of this pattern within me. I absolutely love how the changes are all so organic and subconscious. I don’t have to consciously TRY to change or heal myself by my thinking or actions. This in itself is such a great relief to me!! Thank you Mireille for so unselfishly sharing this technique that you have created and sharing with anyone in the world who cares to learn it. I am sharing it freely with all I know. Thank you for embracing the MIR-Method! I am really glad you feel it helps you in become more relaxed, being a perfectionist! Well, being a created perfectionist, like you say. And yes, there is no need for digging into your subconscious to find the causes. The subconscious already knows! I love this myself too about the MIR-Method. It is SO relaxed! Thank you for sharing it with others! And lots of good luck to you! I have Meniere’s Syndrome of the ear. The vertigo was a horribly occurring experience of several times per week with accompanying vomiting and malaise. I started doing the MIR-Method statements for four months and only had two occurrences of vertigo in a five month period. I ceased doing the MIR-Method statements after about a month, I started experiencing severe vertigo about twice weekly. I have started my MIR-Method statements again this week and have had no vertigo this week, only some light headedness. The MIR-Method works for me! That is really awesome news! 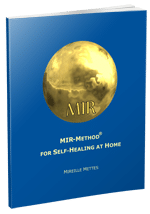 I expect thousands of people with Meniere’s Syndrome will be SO happy to read this and give the MIR-Method a try as well. I am VERY glad for you and hope all the vertigo’s will stay away in the future. Just GREAT news! Am SO happy for you! Thank you so much for freely sharing the MIR-Method so freely. I have benefited on many levels by intentionally stating these 9 healing statements. Its been a while since I did the practice of this method and this post particularly spoke to me as I have been a perfectionist my whole life. But starting this year I have been newly awakened to the fact that I am a fine artist. On New Years Day this year I painted a picture of the Northern Lights in Norway. My art inspires me and puts me in a zone of bliss that lifts my vibration. That’s SO wonderful! I love to paint myself and relate with you about not having to perfect, but enjoy doing it intensely. Great that you have freed yourself from your perfectionism! Wow, the northern lights… I am really curious to see your painting. Can I? You can find mine here: http://www.mireillemettes.nl Sorry to say the website is all in Dutch.